Currency pressure continues to be the norm for LATAM Airlines Group as the company faces currency devaluation in many of the countries where it retains a significant presence. The challenges created by the currency devaluations are now well documented, and are pressuring the company’s unit revenue results. LATAM is obviously working to combat the pressure created by devaluations in most of the South American countries where it operates, including attempts to change point of sale mix and a focus on regions where stronger demand can offset some of the weaker areas within its network. 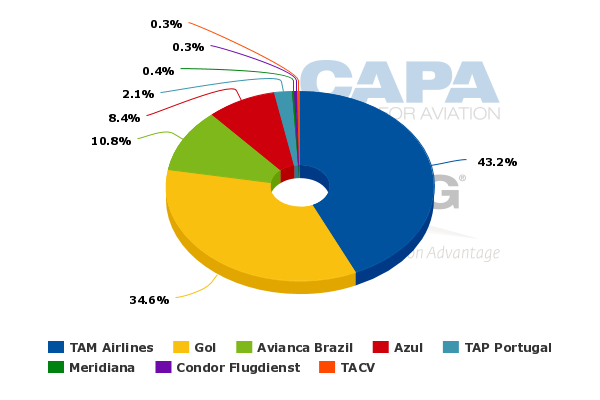 Brazil remains a challenging market for LATAM and numerous other airlines, particularly due to the decline in the country’s corporate demand. But despite the continuing weakness in the country’s domestic and international markets, LATAM continues to flesh out its Brazilian network, and plans to build a new hub in the country’s Northeastern region. During 1Q2015 LATAM endured a 13% and 23% depreciation in the Chilean and Colombian currencies respectively. Argentina’s currency dropped 14%, and Brazil’s currency, which has been under pressure for roughly a year, fell 21.4% year-on-year during 1Q2015. The currency pressure drove down the company’s consolidated unit revenues by 14.7% year-on-year during 1Q2015 (measured in USD). 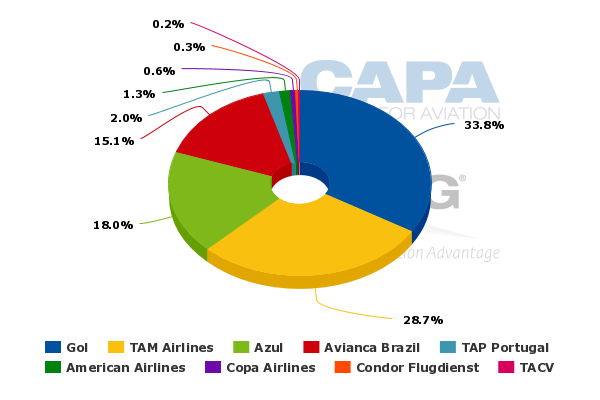 Data from CAPA and OAG show that for the week of 8-Jun-2015 to 14-Jun-2015 Brazil is LATAM Airlines Group’s largest country measured by international seat and ASM deployment. Chile and Peru are the company’s second and third largest countries measured by seats and the US and Chile represent LATAM’s second and third largest international markets measured by ASMs. In 1Q2015 LATAM’s unit revenues in its Spanish speaking countries – Chile, Peru, Argentina, Colombia and Ecuador – fell 4.1%. However, the company concluded that yields in those market generally showed positive trends during the quarter when measured in local currencies. Capacity in those markets increased 3.7% year-on-year. Unit revenues in LATAM’s international markets, long-haul and regional, dropped 8% year-on-year during 1Q2015. Capacity increased 2.4%, most of which was deployed to the Caribbean, said LATAM. The currency pressure affected yields as local demand for international travel was soft. To combat the weakness, LATAM stated it was adjusting point of sale mix to markets with stronger demand. Brazil’s well known challenges – economic weakness and currency pressure – continued to weaken LATAM’s domestic performance in the country. In 1Q2015 the company’s unit revenues in the Brazil domestic market fell 19.3% on a 1% increase in capacity. Brazil’s GDP is projected to contract 1% in 2015 and the BRL is trading at BRL3.14 against the USD (as of 7-Jun-2015). Corporate demand in Brazil has been suffering since the World Cup Soccer tournament held in the country during 2014. The company explained that even with its capacity reductions in Brazil, it has however maintained its corporate market share. LATAM executives recently stated that during the first part of 2Q2015 some signs of a pricing recovery emerged, but there was no real change in demand patterns. LATAM estimates that 35% to 40% of its corporate international travel for Brazil stems from point of sale in other regions, versus roughly 10% on its competitors, so that obviously gives the company some leverage. Despite the unfavourable operating conditions in Brazil, LATAM has outlined plans to establish a new hub in the Northeastern region of the country, to expand operations between Europe and South America. Fortaleza, Natal and Recife are are candidates for TAM’s new hub. TAM CEO Claudia Sender recently told news outlet Bloomberg that the move should give customers more direct access across the trans-Atlantic, and also result in faster turnaround times that would cut operating costs. The bulk of TAM’s trans-Atlantic flights are operated from Sao Paul Guarulhos, the country’s busiest airport located in the Southeastern region of Brazil. Ms Sender told Bloomberg that TAM estimates 1.5 million passengers would travel on the routes from the new hub, which could include 10 European destinations. LATAM aims to name the new hub by YE2015 and operations are expected to start in Dec-2016. 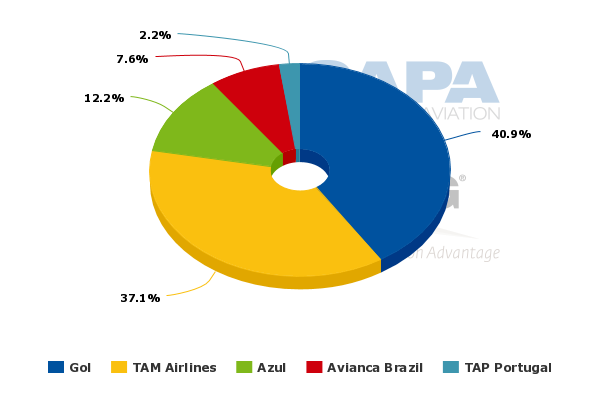 Among the three airports under consideration, TAM is the largest airline in Fortaleza with a 43% seat share (8-Jun-2015 to 14-Jun-2014). It is the second largest at Natal and Recife behind Gol, holding seats shares of 37% and 29%, respectively. Recife is the largest metropolitan region among the three candidates, and the airport is among the busiest outside Sao Paulo Guarulhos and Rio de Janeiro. No airline operates a great deal of trans-Atlantic flights from those airports, with the exception of TAP Portugal, which operates to Lisbon from all three facilities. It is tough to say if LATAM is opting to establish a Northeastern hub as a means to fortify itself as its rivals are reportedly interested in acquiring a more than 60% stake in TAP. Reuters has stated that Azul chairman David Neeleman and German Efromovich are pursuing the airline. Mr Efromvich heads Synergy Group, which controls Avianca Brazil. The establishment of the new hub is also likely part of TAM’s network evolution after the merger with LAN to create LATAM. In 2012 LATAM started to revamp TAM’s long-haul network to centre most of TAM’s trans-Atlantic flights at Guarulhos, cutting service from Rio de Janeiro to Orlando, Frankfurt and Paris. 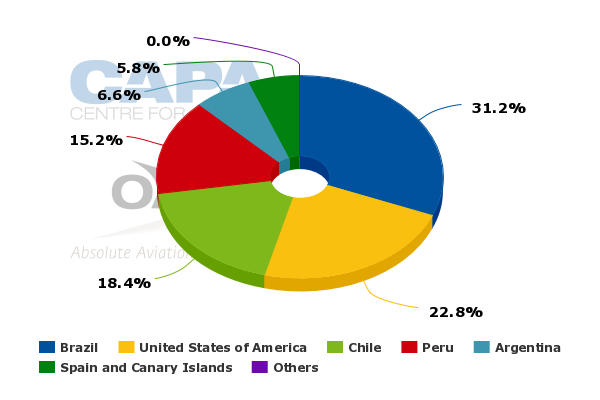 LATAM is also making a push from Brasilia in 2015 adding 11 domestic destinations from the airport. Previously, LATAM has explained that Brasilia is attractive given its central location in Brazil, and that Brasilia’s GDP per capita was higher than other South American cities. With a strong hub in Brazil’s southeast, and a growing presence in Brasilia, establishing a stronghold in the country’s Northeast to leverage more favourable service to Europe seems like a logical step in LATAM’s long-term strategy in Brazil. The company is stressing that the establishment of the hub will be supported from its current fleet plan, and require no additional aircraft deliveries. 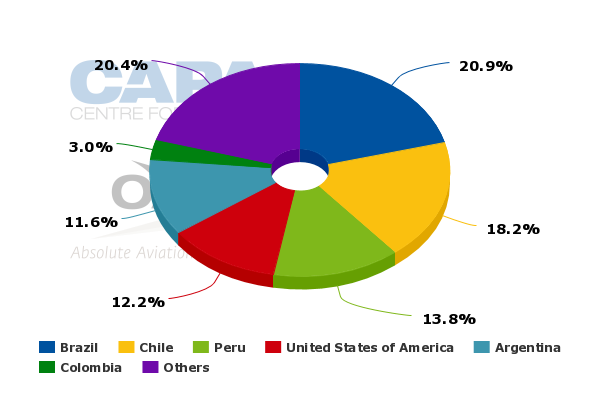 LATAM’s fleet projections show it will operate 322 passenger aircraft at YE2016 compared with 311 at YE2015. LATAM is planning a system capacity increase of 2% to 4% in 2015, with flat growth in the Brazilian domestic market and 4% to 6% in both international and Spanish speaking markets. At this point currency pressure is not a new challenge to LATAM, as most of its major markets in South America during the last couple of years have endured weak conditions and, in many cases, sagging economies. The lingering currency pressure could continue to be a challenge for LATAM in the short to medium term. But its network moves show that LATAM is working to leverage the combined networks of LAN and TAM to exploit the strength each airline brings to the company. With hubs in Sao Paulo, Lima and Santiago, growing strength in Brasilia and a soon to be revealed hub in Northeastern Brazil, the logic for the merger remains sound, and LATAM appears to be moving patiently as it works to exploit its position as Latin America’s most powerful airline group.